British Columbians go to the polls on Tuesday to elect both a new government (using our archaic, vote-distorting Winner-Take-All/First-Past-The-Post system) and to vote in a crucial referendum on electoral reform. A recent poll shows the NDP trailing the Liberals by 2 per cent (42% to 44% respectively). Under a sane voting system, that would translate into a narrow Liberal minority government. But under our crazy, existing system, that could very well translate into a NDP majority government, like it did in 1996 when a three-point gap in the vote handed the second-place party all the power for five more years! B.C. Liberals should remember how they felt the morning after the 1996 election, when they had been shut out of power by our voting system despite winning the vote. That scenario could repeat itself on Tuesday and the only way to ensure it never happens again after this election is to vote for BC-STV. Enough of our crazy, vote-distorting First-Past-The-Post system! The time to fix it is now and hopefully as many Liberal voters in B.C. as possible will agree. To those who are fighting to keep our archaic system because it lines their pockets and hands their parties all the power with only a minority of votes, I say 'Shame on You!' You're the same types of people who would've opposed extending the franchise to Aboriginals, to women, to non-land owners, etc. in the past because such a change would've undermined your hold on power. And today, you're still up to your nasty little tricks. I hope voters ignore your distortions and vote for change. Can you imagine if you placed an order at a drive thru for two hamburgers, two fries and two bottles of water - and instead when you got to the window, they handed you four fish pies and some asparagus? Or if you sat down at a restaurant and ordered some sushi and green tea, and instead they brought you a piece of pork loin, potatoes and coffee and forced you to pay for it? Would you be annoyed? Of course you would. Yet this is how our current voting system works. The voters head to the polls and vote one way - and the First-Past-The-Post system spits out something they didn't ask for. If BC-STV passes, this will never happen again at the provincial level in British Columbia. If you like getting what you didn't order, vote to keep our archaic, vote-distorting system. If you actually want to get what you ask for in elections, vote for the Single Transferable Vote. Have a look at this great video by a great woman, Christy Clark, now out of politics, who says she opposed STV in 2005 because she knew it would be bad for politicians and backroom types. Now out of politics, she's seen the light. VOTE BC-STV for fair election results that make sense and reflect the society that voted. In the 1996 British Columbia election, the B.C. Liberals won 42% of the vote while the NDP won 39%. Unbelievably, that translated into a NDP majority with 39 out of 75 seats (the Liberals won 33 in that election, 2 Reform incumbents held their seats, as did one Progressive Democratic Alliance incumbent.) The NDP went on to govern for five more years. With the Liberals and NDP at exactly the same levels of support in a poll released last night, it begs the question: what happens if another three-point lead translates, once again, into a defeat for the Liberals in the 2009 election? If you lose the vote by 3 per cent, does that represent a mandate to govern with a majority? Under Winner-Take-All/First-Past-The-Post, the answer is an unfortunate YES. This is the problem with our existing system: it distorts voters' wishes. All B.C. Liberals should remember well what inspired them to explore the issue of electoral reform in the first place: the great need for a fairer system. Just in case First-Past-The-Post produces yet another crazy result this year, perhaps it's best to vote YES to BC-STV so that, in the future, the party with the most votes actually wins the election. Food for thought. New TV ad for BC-STV! "Fair Results"
Check out this great new ad put out by the Yes to BC-STV side in the B.C. referendum to be held May 12th. First-Past-The-Post is clearly a broken voting system that doesn't deliver representative legislatures in Canada. BC-STV represents the best chance for electoral reform in Canada. For more information, go to stv.ca. And congrats to the Yes side for this great ad. Federal Liberals propose STV for electing national leaders: If it's good enough for Liberals, why isn't it good enough for Canadians? At our national convention in Vancouver this week, federal Liberals will consider a proposal for changing how we elect national leaders. "The one-member-one-vote proposal for choosing a party leader was narrowly defeated at the 2006 Liberal convention in Montreal, in 2006, however it's expected that it will be adopted this time around. The national executive has put forward a proposal whereby each riding association will be assigned 100 points and individual party members will rank their choices for leader on a single transferable ballot. In each round of vote-counting, the candidate with the lowest number of points, which will be allotted according to percentage so that urban ridings with more members don't get more influence than rural ridings, will be dropped from the ballot and everyone who put that person as their first choice will then have their second choice counted. The vote-counting process continues until one candidate gets a majority of points nationally, and then that person becomes the leader." To read more about this week's convention, please click here. It's coincidental that Liberals will be considering this proposal in British Columbia, where a referendum on adopting the Single Transferable Vote in provincial elections is also being considered by voters. There have been many Liberals who continue to oppose any opportunity to dump our antiquated, 'Winner-Take-All/First-Past-The-Post' voting system in Canada. Many of them will be present at the Vancouver convention, without a doubt. One wonders how these Liberals will vote on the proposal at the convention. I have a few questions: If the Single Transferable Vote is good enough for electing a national leader and Prime Minister, why wouldn't it be good enough for electing our legislatures? How can those Liberals who are dead set against any type of proportional voting system for Canadians (because such systems might undermine their quest for power) then turn around and support a democratic provision like the one being proposed at the Vancouver convention? Why don't those same Liberals who support First-Past-The-Post also support such a system for electing national leaders too? Or indeed local candidates? Wouldn't that be more efficient? Whoever leads on the first ballot would automatically win the leadership. Who needs majority support when you can grab power for yourself by simply winning the most votes? If you support First-Past-The-Post for all Canadians, why don't you also support it for Liberals? Of course I ask these questions a bit in jest. I favour proportional voting that actually reflects how people voted. I also think 50 per cent plus one constitutes a majority, unlike others who favour First-Past-The-Post. If one doesn't have majority support from voters, how can one be seen as legitimate? The truth is they can't. This principle has long been adopted by Liberals when it comes to electing leaders or candidates. Sadly, not as many Liberals have embraced the same principle when it comes to all voters electing legislatures. For them, a system designed to award complete power based simply on a plurality of support is good enough. Sometimes even coming in second in the vote is enough to win total power under First-Past-The-Post. How can Liberals and others who support our existing voting system in Canada call themselves democrats? I'm truly not sure. If your lust for power and desire for a quick, convenient result trumps your support for fair, democratic representation, what does that say about you as a person? One has to wonder. In any event, I truly hope the single transferable vote proposal of efficiently and fairly electing national leaders is passed this weekend in Vancouver. It appears that the pro-change side has a decisive lead with less than a month to go before British Columbians vote in the May 12th referendum/election. According to Angus Reid, 65% of B.C. voters intend to support BC-STV next month. Among those between ages 18 to 34, support runs at 74 per cent. The poll was conducted in March. May's referendum marks the second time in four years in which British Columbians have the opportunity to fix their broken electoral system. In 2005, 58% of them voted for change, but thanks to the government-imposed 60% threshold, change was thwarted. It's strange that 39% is enough to elect a majority government in B.C., while 59.9% isn't enough to change the electoral system. Newfoundland joined Confederation in 1949 with just over 50% of the vote. Why do we continue to quietly accept this artificial 60% barrier imposed by partisan politicians who are clearly doing everything they can to keep the current system? Regardless, if the Angus Reid poll is to be believed, supporters of fair voting may soon witness their first taste of major victory in Canada. No doubt, those on the No side who believe it's right for one party with fewer votes than the opposition to form a majority government, and those who love the idea of forcing a narrow agenda supported by a minority of voters down the throats of the majority, will find these poll numbers discouraging. If BC-STV is passed, backroom hacks and politicians who used to rely on safe seats and a divided opposition to slip through and win power and unchecked control for four or five years will have to re-think their game plan. Thus far, the No side in B.C. has seen fit to paint STV as too confusing for average voters. They're pointing to allegedly complicated counting processes as reason enough to keep our current system. Of course, few dare to mention that the formula used to translate votes into seats under our existing system is wildly unpredictable at best. 40% of the vote could translate into both a large majority government, or see a party almost wiped out completely under our existing system. Can you imagine if you placed an order at a drive thru for two hamburgers, two fries and two bottles of water - and instead when you got to the window, they handed you four fish pies and some asparagus? Would you be annoyed? Of course you would. Yet this is how our current voting system works. The voters head to the polls and vote one way - and the First-Past-The-Post system spits out something they didn't ask for. If BC-STV passes next month, this will never happen again at the provincial level in British Columbia. I had always hoped with enough education that Canadians would see for themselves how terrible our existing First-Past-The-Post/Winner-Take-All system truly is - and that changing it as soon as possible must be a priority. I've contributed to the Yes to BC-STV campaign and I strongly encourage all supporters of change to do the same in order to keep this substantial lead intact for the May 12th vote. British Columbians have an opportunity to lead the nation next month. I'm hopeful they'll take it. Liberal Party supporters in favour of the British Columbia - Single Transferable Vote option before B.C. 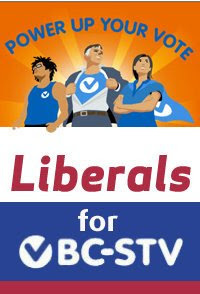 voters in a referendum on May 12th (being held in conjunction with the provincial election) have launched a new Facebook group called 'Liberals for BC-STV.' Click here to link to the new group and join! This site officially endorses BC-STV as the best option for improving democracy in our western-most province, which has seen its share of bizarre, distorted election results courtesy of our existing 'Winner-Take-All/First-Past-The-Post' system. In 1996, the NDP won a MAJORITY government in B.C. despite trailing the B.C. Liberals by three per cent in the popular vote. Then in 2001, the B.C. Liberals won 97% of the seats with just 58% of the vote. In the last election, 46% support for the B.C. Liberals handed that party 58% of the seats and 100% of the power. So British Columbians are well aware of the flaws of our existing voting system! That's why that province's Citizens' Assembly recommended a change to BC-STV. For more on the great improvements that BC-STV will bring, click here. We need your help in British Columbia. This week marks the start of the election campaign here and included on the ballot is a critical referendum on electoral reform. It's a rare second chance that we're getting because we got nearly 58% support in a referendum four years ago. However, the threshold was, and is, set at an unprecedented 60% of the vote. Your support could help push us over the top. In Canada there is no place closer than BC to making change happen. If we win this referendum the momentum of electoral reform could sweep across the country. British Columbia would be the biggest jurisdiction in North America to adopt change and voters everywhere could see fair voting in action. You can help make history by making a donation at http://www.stv.ca/support. It won't be easy. Electoral reform has recently been defeated in PEI and Ontario. In each case the NO side launched misleading, negative, scare tactic campaigns. Here, their pollsters have already started testing fear-based messaging on our voters. Our opponents believe that if they can scare off voters here then electoral reform in Canada will stopped. This time we will be better prepared for their attacks. Already we've got the momentum on the internet and have had thousands of people sign up at stv.ca to make a contribution or volunteer their time. We're better organized. In 2005 BC referendum campaign, we had one part-time staff, very little organization across the province and around 200 active supporters. Today we have five full-time staff and thousands of active supporters throughout the province. We're also way ahead of our fundraising from last time and have internal polling showing momentum is on our side. Currently, we are polling slightly above the 60% threshold we need to win. BUT – the other side also has much more funding than in 2005 – we haven’t faced the half a million dollar negative ad campaign our opponents are planning for the end of the campaign. That's why we need your help today. This race is extremely tight, so anything you can raise will significantly increase our chances to win. Please consider making a significant donation today - the timing has never been so critical. Liberal blogger Danielle Takacs posted The Case for Electoral Reform from a Liberal Perspective today on her popular blog. The well-written post lays out four main reasons why Liberals should support electoral reform in Canada. Check them out here. Out in B.C., where voters will again cast judgment this May on the First-Past-the-Post system which handed the NDP under Glen Clark a majority government in 1996 despite trailing in the vote by three percent, the battle continues. NDP backroom pundit David Schreck (who used to work for Glen Clark) has been campaigning vigorously against the new BC-STV system, distorting issues in favour of our broken voting system. But it seems even Schreck's fellow New Democrats aren't listening to him, as another NDP MP from B.C. is now publicly in favour of change. Danielle Takacs writes further today on how Electoral Reform Is a National Unity Issue. Takacs posts again about The Daunting Prospects of a Liberal Majority Under First Past the Post: Why Liberals Should Prefer a Preferential Balloting System While I do agree that Instant-Run-Off voting is better than our current Single-Member Plurality system, I don't view it as a major improvement over it. If we are to embark on real electoral reform, we should move to a good form of proportional representation that still ensures that voters have the final say over who's elected, not political parties. For me, that system is STV. At least one of the federal NDP's Members of Parliament from British Columbia is endorsing change in this May's provincial referendum on electoral reform. The British Columbia NDP will not take an official position on STV, but some of the strongest voices against the change in that province include those of former party strategist David Schreck and Bill Tieleman, who was an adviser to former Premier Glen Clark. This makes sense perhaps as the B.C. NDP won a majority government in 1996 despite trailing the Liberals by three percent of the vote. That 1996 election result remains one of Winner-Take-All's biggest foul-ups, handing re-election to Glen Clark despite trailing considerably in the popular vote. Clark went on to bury what was left of that province's fragile economy, stretching out what should've been five years of NDP rule into ten. It's interesting to note that most New Democrats in places like Ontario, plus federal NDP'ers like Savoie and federal leader Jack Layton, favour switching to a proportional representation voting system. However, in provinces where the New Democrats traditionally vie for power (like B.C., Saskatchewan and Manitoba), most of that progressive, pro-change idealism seems to go out the window. The Saskatchewan NDP only proposed possible electoral reform after enjoying government for 16 years, and that party's defeat in 2007 ensured the issue would continue to go ignored for the foreseeable future in that province. Shame. No doubt, many Liberal, Tory and other party supporters in areas where those parties traditionally win false majorities under Winner-Take-All also tend to oppose electoral reform because to do so means less power for them (we experienced many hostile, anti-change Liberals in the 2007 Ontario referendum). So Savoie's support of fair voting in her home province, where her own party sometimes wins under Winner-Take-All, is to be commended. The battle has begun again to reform British Columbia's voting system. As in 2005, voters will be able to cast judgment on the existing 'Winner-Take-All' voting system in B.C., or choose BC-STV (or British-Columbia's Single Transferable Vote system) as recommended by that province's Citizens' Assembly a few years ago. Loenen was a former Social Credit legislator from Richmond, B.C. and he writes eloquently about the need for change. Please expect more useful links on this site as we get closer to B.C. 's voting day on May 12. Why is the Toronto Star so obsessed with saving 'Winner-Take-All'? Yet again today, the Toronto Star editorial board saw fit to use this week's Israeli election as an excuse to rail against any form of proportional representation. Readers will recall how, in the heat of the 2007 Ontario referendum campaign, the Toronto Star frequently printed misinformation about the proposed electoral reform called Mixed Member Proportional. The Star's Kerry Gillespie wrote in a news article printed on the front page that some Ontario MPPs under that system would be "appointed" to the legislature, when in fact they would be elected from province-wide party lists. No corrections were made, falsehoods were allowed to fester in the public's mind, all the while the mainstream, private media, like the Star, continued to rail against the threat of religious minorities "seizing" control of our legislature using the "3% threshold". If the Star is so frightened by the prospect of 3% or 5% of voters getting the same percentage of seats in legislatures and wielding what little power they have, why is the Star not also equally frightened by a voting system that hands one single party with as little as 35% of the vote a majority of the seats? The Star argues that we should tremble should a small party get one of its policy planks implemented in a coalition government agenda. But give one party full and unchecked power to implement its entire agenda on the public with only 35% of the vote, and that is perfectly alright, the Star argues. That's how 'Winner-Take-All' works and it's certainly not democratic. The Star uses the Israeli example to argue that all forms of proportional representation should be shunned. In truth, the majority of democracies around the world use some form of PR. Israel is one of the few that uses the pure list system and with its very diverse society we see the kinds of results we saw this week. In truth, if 'First-Past-The-Post'/'Winner-Take-All' were in place in Israel instead, it's entirely possible that the second place Likud party would have won the election as First Past The Post has a tendency to skew voters' wishes badly and sometimes even hands power to the second-place party. Why doesn't the Star mention that most European countries use PR and, for the most part, are models of stability? Meanwhile countries like Canada, the U.S. and Britain mostly use First-Past-The-Post and our countries seem no better off in this economic downturn. Coalitions under PR are not the same as coalitions under our current system (Winner-Take-All). Coalitions or minority governments under our current system normally last two years or so as the temptation to pull the plug and force an election can be so great (see what Stephen Harper pulled last fall for a classic example). When a party sees its support go up in the polls from 35% to 38% under our system, backroom political hacks are inclined to go to the polls because suddenly it looks like they might be in what the mainstream media calls "majority territory." Ask your average high school or even elementary school student if 38% or 40% is "majority territory" and you'll be laughed at and receive an 'F'. Under PR, winning an extra 3% of the vote does not translate into an extra 10% to 15% more seats. As a result, politicians are forced to work rather than play partisan games and coalitions form stable majority governments which generally last their full term of office. Under PR, all votes are counted and reflected in the make-up of the legislature. Under 'Winner-Take-All', less than half of votes cast have any impact on the make-up of the legislature. Under PR, no party with less than 50% of the votes can force its agenda onto the people. Under our current system, this is a regular occurrence. Shouldn't the Toronto Star be equally frightened by this reality? And if not, why not? Voters in British Columbia get a second chance to cast their ballots in a referendum this May on a new proportional representation voting system called Single Transferable Vote. With this in mind, former members of the B.C. Citizens' Assembly on Electoral Reform, which in 2004 recommended the new voting system for the province, will gather in Vancouver for a public forum Saturday. Read more about it here. An alternative to proportional representation: IRV? Liberal blogger and Guelph Mercury Community Editorial Board member David Graham writes in the Guelph Mercury today in favour of Instant Run-off Voting (or IRV). This site officially endorses moving toward some form of proportional representation in Canada. While Canadian voters have rejected mixed member systems in Ontario and Prince Edward Island in recent referenda, voters in British Columbia endorsed a system called Single Transferable Vote (or STV) with 58% support in a 2005 vote. That support wasn't sufficient to change systems in B.C. because the government set approval for the change at 60%. But the government of Gordon Campbell has set a repeat vote on STV in B.C. for May 2009. As Canadians don't seem to want to change to a mixed member system, this site continues to endorse Single Transferable Vote as the best alternative to our existing Winner-Take-All, or First Past The Post system in Canada. If voters in British Columbia give STV enough support next May, it will be a huge win for proportional representation in Canada and might promote the cause across the country. If STV fails in B.C. this May, it might be a fatal blow to the PR dream in Canada. If that happens, alternatives like IRV as proposed by Graham might be the only type of electoral change possible in this country. Orphan Voters.ca: "Please, sir, I want some democracy!" Fair Vote Canada has recently launched a timely new site called 'Orphan Voters.ca'. Who are Orphan Voters? The site defines them as: "The neglected and democraticallly abused [Canadian] citizens who find the doors of Parliament slammed in their faces because their votes elected no one." The site estimates that over 7.5 million Canadians cast votes in the last election in 2006 which had no effect whatsoever on the make-up of the Parliament. That was 51.2% of all voters who took the effort to cast a ballot, yet their vote essentially counted for nothing. Check out the site when you have the time and take part in the contest guessing how many orphan votes will be cast in this 2008 election. The site looks great. Congrats to Fair Vote for getting creative in their messaging and their ongoing campaign to keep this issue at the forefront. With all the talk in this election of how Harper is flirting with a majority government with only 38-40% of the vote, it begs the question: Why do we put up with our archaic, anti-democratic voting system? 40% is not a majority anywhere else in life. Why is it a majority in our Canadian elections? Do the majority of Canadians really want Harper's policies shoved down their throats? No. Could it happen anyway because of our archaic First-Past-The-Post system? Yes. Do we need to change our voting system as soon as possible? Yes! Vancouver Sun columnist Barbara Yaffe writes today that "a new political reality has taken hold in Ottawa. Minority government has become the norm." "University of Montreal political scientist Henry Milner is expressing dismay that more Canadians -- particularly the chattering classes -- have not picked up on the change...Milner says voters are getting what they want out of the current Parliament; polls show Canadians like minority governments. And MPs seem to understand their constituents don't want repeated electoral contests. Workable minority governments are a novel idea for Canada. Once, opponents of proportional representation voting systems argued that PR would yield unstable minority governments. With the current experience of workable minority government that manages stability, this threat surely will be less potent." Most countries in the Western world have proportional electoral systems that don't hand one party a majority of seats with only a minority of votes. It's time Canada rejected our antiquated, vote-distorting 'Winner-Take-All' system and embrace reform that truly reflects the wishes of voters. Minority governments are better than one-party majority dictatorships. Fair Vote Canada held its annual general meeting this past weekend in Toronto. The following Canadian Press story sums up some of the discussion at the meeting, which focussed mainly on Ontario's recent referendum fiasco on Mixed Member Proportional (or MMP). "These kinds of initiatives are very appealing to opposition parties," said Lawrence LeDuc, a political scientist at the University of Toronto, in a panel discussion on the outcome of the referendum. "Opposition parties always like to get themselves on the side of reform movements of one kind or another, and then usually when they come to power they lose interest in those ideas or, even worse than that, they try to kill them." LeDuc blamed the "one-sided" news coverage during the election campaign for the referendum's failure. "They had made up their minds very early on that the whole thing was just a joke, not worth reporting on," he said, citing a study that indicates the news coverage of MMP was overwhelmingly negative. But the government is also to blame for failing to properly inform voters about the new system in the lead-up to the election, added LeDuc. "(Elections Ontario) were basically, I think, mandated to not say anything at all that could be construed as real information. So, therefore, the information they put out said there's going to be a referendum, and your vote in that referendum is really important. Full stop." Because so many people were uninformed - less than a week before the election, 24 per cent of people surveyed said they didn't know anything about MMP - we should be careful how we evaluate the results of the referendum, said George Thomson, the former chair of the Ontario Citizens' Assembly on Electoral Reform. "Perhaps Ontarians prefer the status quo. I just wish we'd had a process that I could look at and feel more confident that an informed Ontario electorate prefers the status quo," said Thomson. Thomson described the Elections Ontario information campaign as "$70,000 spent on this big picture of a fellow looking confused and not much else." An informed electorate is essential if Fair Vote wants to change the way Canadians elect their politicians, agreed June Macdonald, president of Fair Vote Ontario. "This expanding through the province, through the dint of personal communication, people talking to people, I think that's what makes the difference," said Macdonald. "Whenever I talk to people, they understand it. They get it." But LeDuc cautioned that people shouldn't expect another referendum on MMP any time soon. "However you view the referendum outcome, the fact that there was a referendum and an outcome creates a real barrier that has to be confronted," he said. Although another referendum may be a long way off, the McGuinty government will strike a select committee on electoral reform next week. No major changes will be considered, but the committee will look at encouraging voter turnout after only 52 per cent of Ontario residents voted in the last election." The growing power among unelected personnel in the Prime Minister's Office is a threat to democracy, retired Justice John Gomery says. Gomery told a parliamentary committee today centralized power in the PMO is a "danger to Canadian democracy" and paves the way to political interference in public administration. He said there is growing gulf between the executive, the Prime Minister and cabinet, and Parliament, giving less voice to MPs. He raised concerns about the political staff in the PMO, saying they are not elected and are not subjected to any rules or laws, yet "have the ear of the most important and powerful person in Canadian government." "I suggest that this trend is a danger to Canadian democracy and leaves the door wide open to the kind of political interference in the day-to-day administration of government programs that led to what is commonly called the sponsorship scandal." To read more, click here or here and here. The Vancouver Sun reflects on the recent lopsided election result in Alberta and how it illustrates the need to re-examine how we elect our governments in Canada. "BC-STV fell just short of the required approval threshold in 2005. Proponents complained that there was no budget for an education campaign to explain how it would work and many voters were simply confused by the apparent complexity of the system. This time the province has budgeted $1.5 million for an education campaign, to be shared in part with "Yes" and "No" forces, but a significant hitch has developed in the electoral boundary reform process that was to have illustrated how an STV system would carve up the province. "Unless members of the legislature are able to forge a compromise that will rescue the politically unpalatable recommendations of the Electoral Boundaries Commission, voters will face another vote on whether to change the system while still uncertain as to how it will look in their home communities. "That would be a shame -- a waste of thousands of hours of work by the Citizens' Assembly and millions of dollars invested in the Electoral Boundaries Commission." For only the third time over the past two decades, Albertans will have a majority government actually elected by a majority of those casting votes, but Albertans supporting opposition parties continue to be dramatically under-represented. By winning 53% of the popular vote, Ed Stelmach’s Progressive Conservatives avoided the false majority results of the 2004, 1993 and 1989 elections in which the party captured a majority of seats even though they failed to win a majority of votes. "We congratulate Premier Stelmach and the Progressive Conservative Party on their victory," said Broscoe. "The PC Party won a legitimate majority government. However, they should not be rewarded with 88% of the seats." "These types of distortions occur regularly with the first-past-the-post system used all across Canada, " said J.D. Crookshanks, spokesman for Fair Vote Alberta , the provincial wing of Fair Vote Canada . "To put tonight's results into perspective, it only took about 7,000 votes province-wide to elect a PC candidate. It took 31,000 votes to elect a Liberal MLA, and 40,000 votes to elect a representative of the NDP. The 64,000 voters who cast ballots for the Wild Rose Alliance were shut out completely, as were the 43,000 supporters of the Alberta Greens. It is no wonder that Albertans are tuning out on a massive scale when so few of their votes count." "With a fair voting system that treats all voters equally, the number of seats won by the parties closely matches the will of the voters," said Broscoe. "We can never know exactly what the results would have been under a different system, but if all votes cast had equal value, Albertans would likely have elected about 44 PC, 22 Liberal, 7 NDP, 6 Wild Rose Alliance and 4 Green MLAs. We would have seen a much stronger opposition, a more balanced legislature, and most importantly, Albertans would have seen their votes accurately reflected in the election results." "Similar outcomes in other provinces have led them to examine alternatives to first-past-the-post," said Crookshanks. " British Columbia and Ontario have convened citizens' assemblies to study different types of voting systems in use around the world, and recommend alternatives. In fact, in May 2009 British Columbians will be voting in a referendum on a fairer voting system called BC-STV, recommended by the BC Citizens' Assembly on Electoral Reform. Given last night's results, we call on Premier Stelmach to convene an Alberta Citizens' Assembly to study the voting system and determine if a better alternative exists for this province." Canada's "Winner-Take-All" voting system, which frequently hands one political party's leader (and his or her unelected backroom hacks) all the power, is given a little perspective today by U.S. Ambassador to Canada David Wilkins. Canada's system has an executive and legislative branch effectively controlled by one person. Can you imagine, Wilkins asked, what it would be like for the U.S. president to be able to appoint cabinet members, senators and judges without lengthy confirmation hearings? "It would change the dynamics (of Washington, D.C.) overnight," he said. But before he set Canadians' heads spinning too much, Wilkins did add a caveat. His boss doesn't face the daily grind of question period in the House of Commons. Wilkins said he liked the Canadian system better "if my guy's in power," but prefers the U.S. system's checks and balances if he's not. Wilkins' statements are right on the money. Canada's voting system hands all the power to one person for four or five straight years with little or no checks on that power, no mid-term elections, no PR-elected Senate (like in Australia). Canada needs more checks and balances on the immense power of our Prime MInisters and Premiers. Fair voting reform, where parties win representation in our legislatures based on the percentage of their votes, would accomplish that without fundamentally changing our parliamentary system. For those who continue to believe our antiquated "Winner-Take-All" voting system produces better government by handing one party all the power, please check out this article in today's Ottawa Citizen by writer Adam Chapnick. As Chapnick points out, minority governments in Canada (where the ruling party is forced to work with opposition parties) tend to produce better foreign policy. "Stephen Harper's decision to reach out to Stéphane Dion's Liberals last week on the question of the future of the Canadian contribution to the mission in Afghanistan is an excellent move, but it is also not as shocking as recent analyses have suggested." "It is rather evidence that, like a number of leaders of minority governments before him, the prime minister has come to realize that an ideologically bold approach to foreign policy in Canada results in neither tangible electoral gains nor the advancement of Canadian interests..."
"...The Harper Conservatives now recognize that co-operation with members of the opposition (who are willing to co-operate) on this file will only benefit Canadians, the Afghan people, and the government itself." Of course, based on previous election results in Canada, the Harper Conservatives could walk away with a majority government under our current "Winner-Take-All" voting system simply by winning an additional one or two percentage points in support, far short of 50%. Such a scenario would clearly fly in the face of Canadian interests with regard to foreign policy. We need a voting system that ensures power is divided in our Parliament proportional to how people actually voted so that one party cannot impose its ideological vision on the majority of Canadians. For those who assume the parties can't or won't work together for the benefit of our country under such a system, recent deliberations in Ottawa over Afghanistan prove otherwise. This site was set up by Liberal Party volunteers who supported the Ontario Citizens' Assembly's proposal for change, Mixed Member Proportional (MMP), in the October 2007 Ontario referendum. This site is not affiliated with any provincial Liberal Parties, or the Liberal Party of Canada, or with Fair Vote Canada. EXISTING "WINNER-TAKE-ALL" SYSTEM HAS HANDED THE 2nd PLACE PARTY A VICTORY IN 6 OUT OF 10 CANADIAN PROVINCES! Electoral Reform Society - U.K.